This weekend I went on a ride up to Lake Hughes in the mountains. I’d wanted to go on a good trip for a while that incorporated lots of turns because I’ve been trying to improve on my banking. So, to the mountains I went. The destination was to the Pelona Sierra Mountains, Lake Hughes specifically. 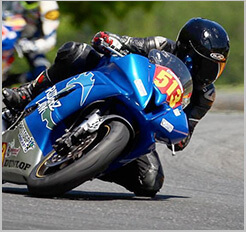 This is a great beginner to intermediate ride, with non-demanding turns and well paved roads. It’s a great location to practice your technique with minimal danger, and have fun while doing it. If you’re heading out towards this destination from Los Angeles, take the I-5 north and exit Lake Hughes. From there take Lake Castaic Road up the mountain. 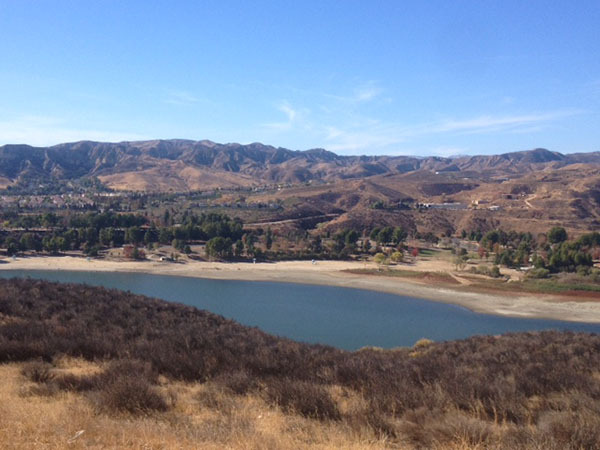 Along the way there are a few beautiful lookouts, and a campground that allows access to Lake Castaic. Lake Castaic Road is pretty long and offers some really nice curves and views. The next turn we took was Lake Hughes. This road follows up with worthy sights as well; lots of trees, mountain views, and even a few homes. The ride isn’t over-crowded at all, so you won’t feel stifled. From here we took a right turn onto Lake Elizabeth Road and found this great restaurant called The Rock Inn. This restaurant is made of stone, has vintage gas tanks inside and offer a great menu to boot. 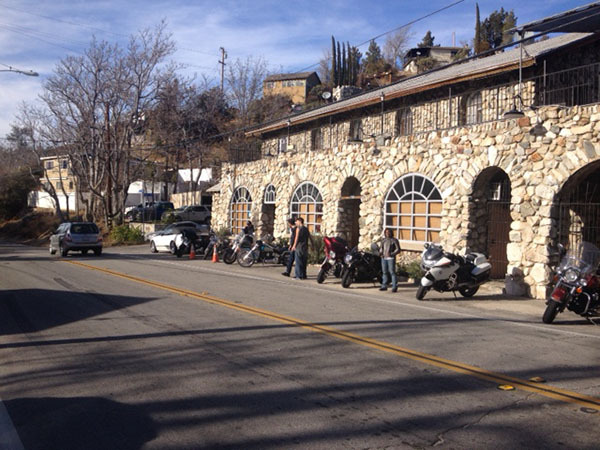 The Rock Inn is definitely a motorcyclist stop as there were about fifteen to twenty bikes parked out front. Everyone is very friendly with strangers that will chat you up about your bike or riding. The staff is very attentive, and the food is very good. This is definitely a recommended to stop if you’re in the area. After we left The Rock Inn we took Elizabeth Lake Road to San Francisquito Canyon Road back down. The route back was enjoyable as well; much of the same quality twists and turns as the ride up. We pulled off to the side and investigated an abandoned and collapsed building. This is a solid trip. I enjoyed the clean roads, scenery, and relaxed atmosphere. Overall, this is a quality ride for all rider levels.